How many orbitals are contained in an atom with atomic number 13? A metallic ion Z2+ with an inert gas structure contains 18 electrons. How many protons are contained in this ion? Which of the following pairs of compounds belongs to the same homologous series? Which of the following pairs of elements forms amphoteric oxides? Which of the following halogens is solid at room temperature? they have the same number of valence electrons. the are in the same period. To which group and period respectively does an element with 15 electrons belong? Which of the following oxides is ionic? Which of the following substances when boiled with aqueous solution of sodium hydroxide would be hydrolysed? Which of the following trioxonitrate (V) salts would decompose on heating to form a metal? C2H4(g) + 3O2(g) → 2CO2(g) + 2H2O(g). SO42-(aq) + 2H+(aq) + ye- → SO32-(aq) + H2O(l). Boyle's and Gay Lussac's laws. I. temperature; II. rate of condensation; III. cohesive forces holding the particles together. Which of the following gases will diffuse most rapidly? heat content of reactants is less than the heat content of product. enthalpy change, ΔH is negative. heat content of product is less than the heat content of reactants. Which of the following statements about intermolecular distances and cohesive forces between gas is correct? 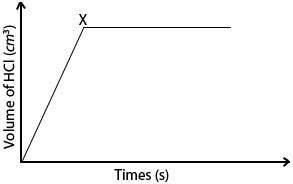 The following diagram illustrates the rate curve that was obtained when Mg reacted with excess dilute HCl. hydrogen gas is produced at a steady rate. the reaction was slowed down. all the dilute HCl has reacted. all the Mg has reacted. Which of the following oxides can be reduced by hydrogen? the determination of saturation in hydrocarbons. Which of the following compounds is the least soluble in water? have strong electrostatic forces of attraction. have a high melting point. conduct electricity in molten state. right leading to the production of more SO3(g). right leading to the production of more SO2(g). left leading to the production of more SO2(g). left leading to the production of more SO3(g). dissolved solute and the solution. undissolved solute and the solvent. dissolved solute and the solvent. disolved solute and the undissolved solvent. Which of the following metals is the strongest reducing agent? A compound has an empirical formula CH2O and molecular mass of 90. Determine its molecular formula. Which of the following reactions would take place when concentrated sodium hydroxide solution is added to hot palm oil? Which of the following compounds is a secondary alkanol? Which of the following substances is a heavy chemical? Which of the following processes does not take place in domestic water treatment? Which of the following products of biotechnology can be used as fuel in place of petrol? Which of the following polymers is thermosetting? 2Al(s) + 6H2SO4(l) → Al2 (SO4 )3(aq) + 6H2O(l) + 3SO2(g) . 2Al(s) + 3H2SO4(l) → Al2 (SO4 )3(aq) + 6H2O(l) + 3SO2(g) . 2Al(s) + 4H2SO4(l) → Al2 (SO4 )3(aq) + 8H2O(l) + 4SO2(g) . Al(s) + 3H2SO4(l) → Al2 (SO4 )3(aq) + 6H2O(l) + 3SO2(g) . Which of the following gases is monoatomic?